(Download original Agrisemantics poster here). 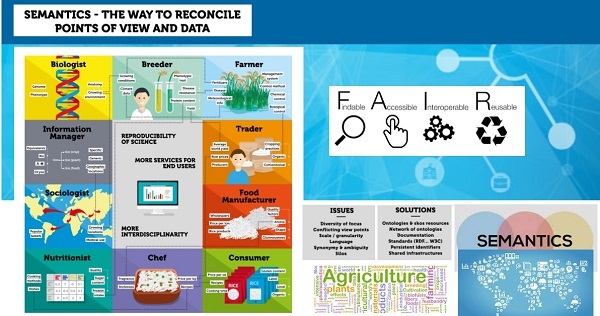 In order to address growing challenges faced by data-driven (agriculture and other) communities, more and more research and innovation is depending on suitable exploitation of models that enable the integration of relevant interoperability solutions, and interoperable knowledge data resources into sustainable digital technologies. Interoperability - which is the ability of reusing, exchanging the data produced by others in your own information system, or vice versa, - is a core ingredient of FAIR data (Findable, Accessible, Interoperable, and Reusable). Find out more about FAIR data and the RDA - Interest Group on Agricultural Data (IGAD) pre-meeting (to be held on March 19-20, 2018, in Berlin, Germany) with a theme “FAIR principles to all elements of the research process in agricultural sciences and related disciplines”, in the January 2018 AIMS Newsletter. According to The Data on the Web Best Practice (W3C, 2017), interoperability largely depends on how well and explicitly the “meaning” of the data is described and supported through the interoperability of metadata. In this context, semantic interoperability plays a crucial role as it takes advantage of both the structuring of the data exchange and the codification of the data with help of vocabularies to interpret the “meaning” of data to reuse, for organizing and providing better access to data. (3) A document on recommendations for the future of semantics for agricultural data - software, functionalities, semantic assets to enhance data interoperability in agriculture. Currently, the Agrisemantics WG is collecting input on use cases on the use of semantic resources for agricultural data - be those controlled vocabularies, metadata schemas or ontologies, or any similar structure you use to describe/define data in your work. The group is interested in knowing what problems and limitations you (might) face when dealing with them. You are invited to take part in this short survey (open by 15 February 2018). To provide your use case, please, go to the dedicated public/shared folder. Your answers are much appreciated and will contribute to the final output of the group - Recommendations on Tools & Services to be included in future infrastructures for Open Science in agriculture. To learn more about other actors in semantics & agricultural data under the IGAD of the RDA, please, take a look at On-Farm Data Sharing WG, Rice Data Interoperability WG, Wheat Data Interoperability WG. This latter group has produced Wheat Data Interoperability Guidelines, which include potential use cases and ontologies to support adoption and use in the agricultural and related domains. (2) Develop appropriate business models for data sharing and related services, especially for our “common goods” such as those supporting semantic interoperability and data discovery. Basis for this work is a Vision Paper "Towards an e-Infrastructure for Open Science in AgriFood" that should guide the technical roadmaps. You are invited to access this vision paper and to make your comments directly on the document. Common vocabularies, application profiles and ontologies are key in ensuring we can make better meaning of the vast amounts of data becoming available every day. The UN Food and Agriculture Organisation (FAO) maintains AGROVOC multilingual thesaurus considered to be the starting point for any individual or organisation working towards disseminating their agriculture-related work globally. The AGROVOC team invites you to take part in this open AGROVOC Survey to help improve the quality of the AGROVOC service. Next to the CAB Thesaurus (CABT), and NAL Thesaurus (NALT), AGROVOC has been also the starting point for the Global Agriculture Concepts Scheme - a global open data repository of interoperable terminological and conceptual information in agriculture. GACS is developed in collaboration among FAO, CABI and USDA. A new expanded GACS Working Group of ag- & data-related institutions (under the umbrella of GODAN) has been currently defining its plan of activities on how to expand, improve quality and structure, and maintain CAGS. Stay up to date by visiting Agrisemantics website. To simplify the task of retrieval and using of value vocabularies on support of data representation, there is a number of initiatives creating, curating and maintaining registries of value vocabularies and application profiles. Some of these registries are BARTOC, FAIRsharing, AgroPortal, Dublin Core KOS Relation Vocabulary and VEST Registry. Work on improvements of the VEST/ AgroPortal Registry is currently being conducted under the umbrella of the GODAN Action project, - a support action to the GODAN initiative. GODAN Action involves Wageningen UR – Alterra, the Food and Agriculture Organization of the United Nations (FAO), the Technical Centre for Agriculture and Rural Cooperation (CTA), the Global Forum on Agricultural Research (GFAR), AgroKnow, the Land Portal, the Open Data Institute (ODI), AidData, the Institute of Development Studies (IDS). To keep up-to-date with AIMS news, please Become AIMS member & sign up for AIMS newsletter and follow AIMS on Twitter: @AIMS_Community.